Create a modern look	with the natural warmth and beauty of wood. Looking for beautiful design, the simplicity of D-I-Y installation and the flexibility to personalize your outdoor living space? RAILSIMPLE® Wood Deck Railing is the answer. Whether you are looking to make a bold statement or simply add warmth and beauty, RAILSIMPLE® allows you to create your perfect outdoor living space. RAILSIMPLE® Wood Deck Railing can be installed in minutes not hours – making them ideal for Contractors and Homeowners alike. 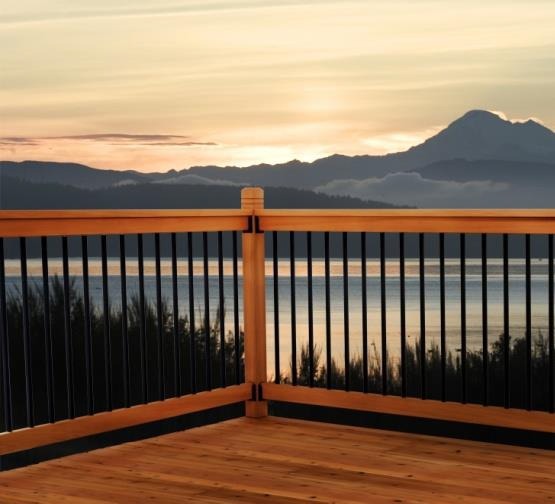 RAILSIMPLE® Wood Deck Railing Kits are available in both Clear Cedar and Pressure Treated. These easy-to-install kits combine clean contemporary lines of a metal baluster with the simplicity of a pre-drilled wood railing. Create a modern look with the natural warmth, beauty, and strength of wood. RAILSIMPLE® Traditional combines the contemporary clean lines of a powder-coated low maintenance baluster with the simplicity of a pre-drilled railing. Create a dramatic look with the natural warmth, beauty, and strength of wood combined with a modern blend of style, convenience, and low maintenance of metal balusters. Offered as a complete railing section (except posts) in a box or as individual components to mix and match, RAILSIMPLE® Traditional can be installed in minutes not hours. Choose from economical Pressure Treated Pine or Premium Grade Clear Western Red Cedar. RAILSIMPLE® Tuscany Railing Kits provide a classically beautiful curved look to make your deck railing stand out from the crowd. With its unique curved baluster, horizontal accent/stay bar and the natural beauty of wood – your deck railing will be the envy of all your neighbours. RAILSIMPLE® Clearview has been designed to offer a clear unobstructed view of your great outdoors. Made with 5/16” thick clear tempered safety glass, RAILSIMPLE® Clearview is 25% thicker than standard glass railing sections. This stronger glass is surrounded by a revolutionary new railing system offering the ultimate in simplicity and low maintenance. Western Red Cedar has long been recognized as nature’s perfect wood for outdoor use with centuries of proven performance. The best of both worlds…everything you like real wood in a low maintenance package. RAIL SIMPLE Clearview is the ultimate in simplicity. Offered as a two-box system with the pre-engineered, pre-slotted rails and rail hanger brackets in one box, and the 6” wide clear tempered glass panels in a separate box. This unique and innovative railing system allows you to simply place the 6” wide glass panel into the pre-engineered rail slots. Seven rail slots, seven glass panels. It’s that easy. Offered in two railing types, western red cedar or treated lodgepole pine and three glass options, for 36” or 42” railing heights or angled stair applications. RAILSIMPLE® Clearview has been designed for use on all deck surfaces including cedar, hardwood, composite, pvc or vinyl. Glass Panels: 5/16” x 6” Clear Tempered Safety glass tested to meet or exceed national building codes. Offered in three length options for assembling a 36” or 42” deck railing or angled stair (7/11 rise/run – 32.5°) application. Rails: Pre-engineered and pre-slotted specifically for use in the RAIL SIMPLE Clearview system. Offered in premium western red cedar or ACQ treated lodge pole pine. Rail Hangers: Quick mount rail hangers simply the installation process, add to the strength of the overall system and come with stainless steel screws. Decorative Post Caps: RAIL SIMPLE offers a broad range of decorative post caps including wood, copper, and solar light caps to complete your railing installation.